All of us have had those times that we wished we had more seating or just a chair to sit back and sip our lemonade in. This project is just that. It’s a space saving chair that you and your friends will fight over. You’ll be able to sit back and relax at just the right angle with this chair. When you’re assembling it you can play with different angles to make sure it’s just right for you. When collapsed it’s less than 7” wide and 37” tall. This makes it very easy to handle and store even for the people that are not built like a superhero. With that said let’s get started building your collapsible chair. 1. I drew a one-inch grid pattern onto my paper first so that I could make sure that everything was even. Here are a few pictures of the patterns I drew up. Once you have your grids drawn transfer the pattern onto them. I plan on making a few of these chairs so I actually used the paper pattern to cut out a 1/8” hardboard pattern. That I would have a wooden pattern for all the others. If you’re only making one, then the paper pattern will be just fine. 2. Transfer the pattern onto the 1” x 6” x 6’ as shown below. One of each size has to be cut out of each board or they will not all fit on the two boards. Cut them out with a jigsaw. ***Do not throw away the scraps you will use them to cut your plugs out of. 4. It’s time to cut the plugs that will cover all of the screw holes. Insert the 3/8” plug cutter into your drill and tighten it really tight. Clamp one of the larger scrap pieces to the table. With firm pressure push the cutter into the wood. You may need to slightly rock the drill to get the cutter to work. I prefer to only drill ¾ of the way through and then use a screw driver to pop them out. You can drill all the way through but you tend to get tear out and you have to stop to take them out of the cutter every time. **Plus the cutter is very hot so it’s not that safe. You need a minimum of 32 plugs. I normally cut at least 10 more then I need just in case some are damaged or I lose some. You don’t want to have to set everything up again. 5. Lay out all the 20” pieces so you can mark where the holes need to be pre-drilled for the screws and plugs. Lay 4 pieces together and the other 3 together. Mark the set of 4 at 1 7/8” from the edge and 1” in from the sides. The set of 3 the marks will be 2 5/8” from the ends and 1” from both sides. Now lay out the 2 - 19” pieces and mark them 2 1/8” from the end and in the center. Once they are all marked you’re ready to drill them. Always use a scrap piece of wood under the piece your drilling. This will give you a much cleaner hole without tear out. Drill so that the counter sinking hole is approx. ¼”-3/8” deep. Sand everything smooth. 6. One last step before we start assembling our chair. Out of your scrap piece of plywood we will cut out 2 jigs to support the legs as we assemble everything. One needs to be 12” x 16 ½” and the other needs to be 12” x 14 ¾”. Once they are cut to size you will need to either drill/cut holes/slots large enough for clamps to fit in along the longer edge of both boards. I used a saw and cut out slots on both sides so that way the clamps set flat. This jig will keep the legs square and in place while you screw the seat and back pieces to them. 8. Lay the set of legs with the one larger end on the table with the curve facing up. This set will have the 3 – 20” pieces on it. 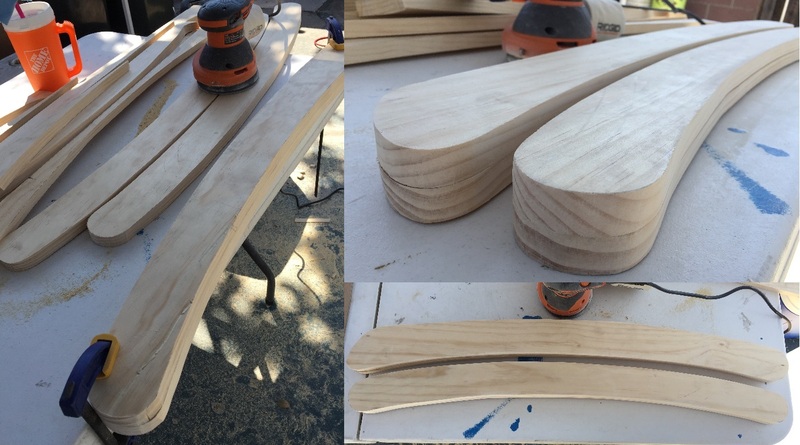 Set the first piece so that the edge of the board is at the start of the curve on the end of the leg. Now center the holes to the legs and clamp it in place. Use the 19” pieces as your spacers and layout the other 2 pieces. 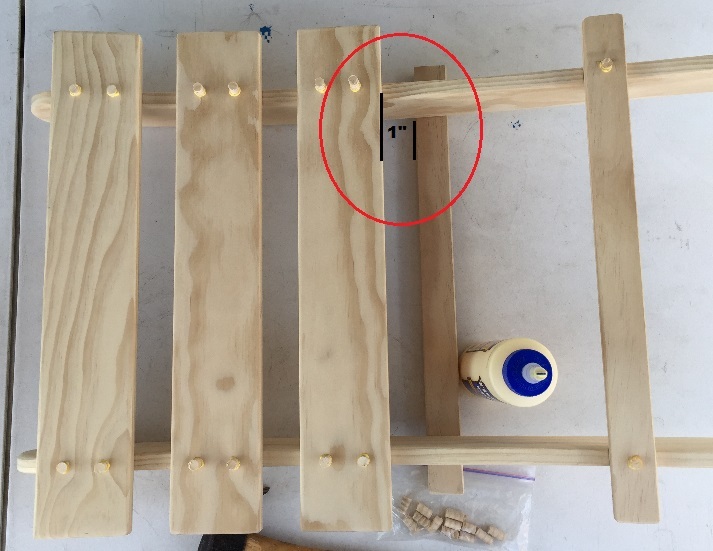 I use my square to make sure that they are all aligned and then I predrill the holes into the legs going through the slats to make sure that the holes are perfectly aligned. I screw each one down as I go. The seat assembly will be very similar. But the curve will face down, the first slat will still line up with the edge of the curve. But the spaces in between are only ½”. I cut 2 pieces from the scrap for my spacers. Repeat the previous steps till all 4 slats are screwed down. 9. Now it’s time to figure out how you would like your chair to sit. I did mine so that it leans back pretty far. But I find it very comfortable. So the first step would be to screw down the upper support/stop. I took my square and laid it flat on the bottom slat so that the ruler part went straight down the leg. This will give you a 1” gap in between the bottom slat and where the first support should be. Once the first support is screwed in stand the chair up to figure out where the other stop should be. A second pair of hand is very helpful at this step. Screw in the last support and try it out. If you are happy with how it feels, then take both supports off and apply glue and screw them back in place. 10. 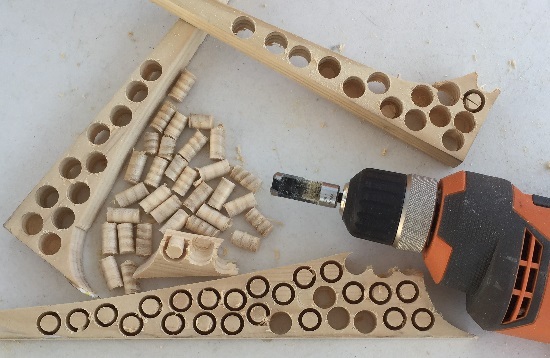 Apply glue to each plug and tap them into place in all 32 holes and let dry completely. Once they are dry use the flush cut saw and trim them as close as you can without damaging the slats. ** I normally cut a thin cardboard spacer to put around the plugs and protect the surface. Once they are all trimmed sand the entire chair smooth and wipe all of the sawdust off. 11. 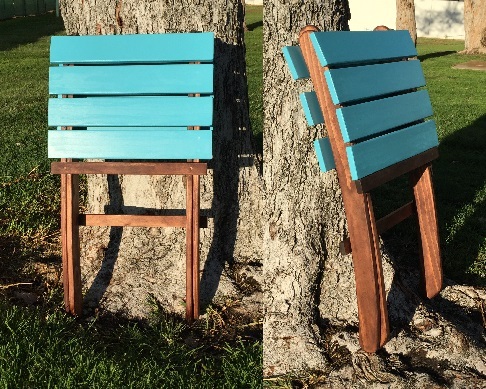 I prefer to stain the legs and paint the slats to give it a pop of color. If you paint the legs they tend to get chipped and/or the paint gets worn off from sliding them back and forth when you store them. I also think that it would look amazing with just a natural finish so that you could see the beautiful wood. What a cool project, I love it, may try to build one myself! 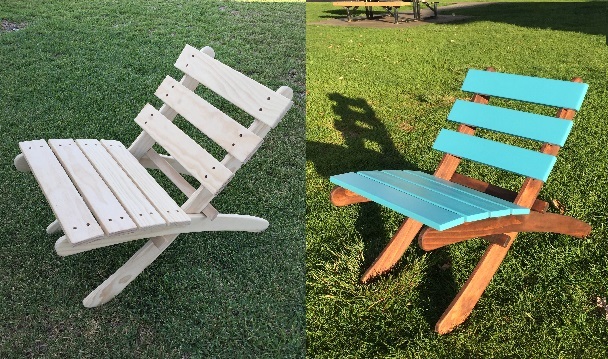 Nice folding chair project. I have one question, how did you make the connecting pivot for the two sections? Spectacular!!! That chair is just beautiful! 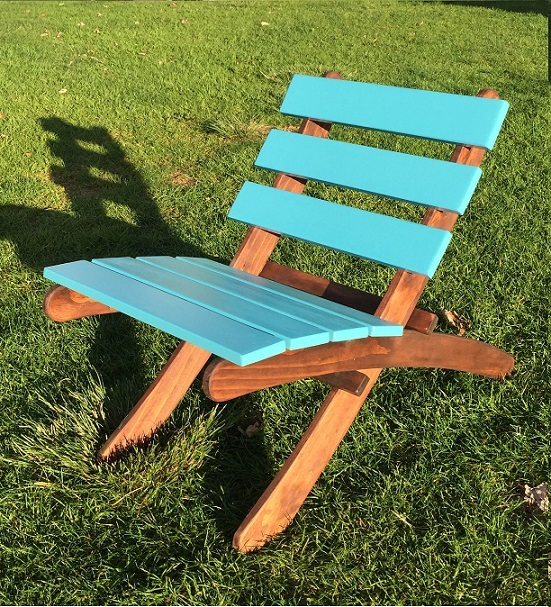 The curved lines, the hand drilled wooden pegs, and the touch of color makes it a "classic" folding chair. It looks perfect to fold up and pop into your trunk and take it on the go for any outside event, bravo! Thank you Mike, Char and Maureen. Maureen.. Yes it is very easy to take with you. I love how it turned out. I plan on making a few more so that way I can use those instead of the typical folding chairs. 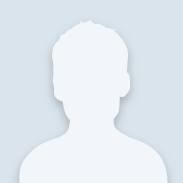 I found a picture of a similar chair that they added arms to so I think the next one I will try adding arms. If they work out I will add them to this one also. I'll keep the community posted once I work out the plans. Char.. It actually doesn't pivot the back and seat are separate pieces. You slide the seat out and then turn it around and slide it into the back. I'll see if I can get a couple of pictures of that process and add them here so that it will be a little more clear for everyone. Thanks again to everyone for the nice compliments.